One factoid from the maps: You can drive coast to coast without driving through a county that voted for Hillary. In looking at the House of Representatives map, I recall the old claim that Republican support is strongest in the old Confederacy. The map of the House of Representatives doesn't support that claim. Lots of the scattered blue patches in Western states are Indian reservations. Here in southwest Nebraska, I believe my county was the furthest left leaning with only 79% voting for Trump. The other counties in my corner of the state were 80% or better. 0bama carried Lincoln (by like 85 votes) and Omaha but some rural counties were over 90% for Trump. Whoops. That should be Clinton and not Zero. Rural areas tend to be more Republican. Conversely, urban areas tend to be more Democratic. 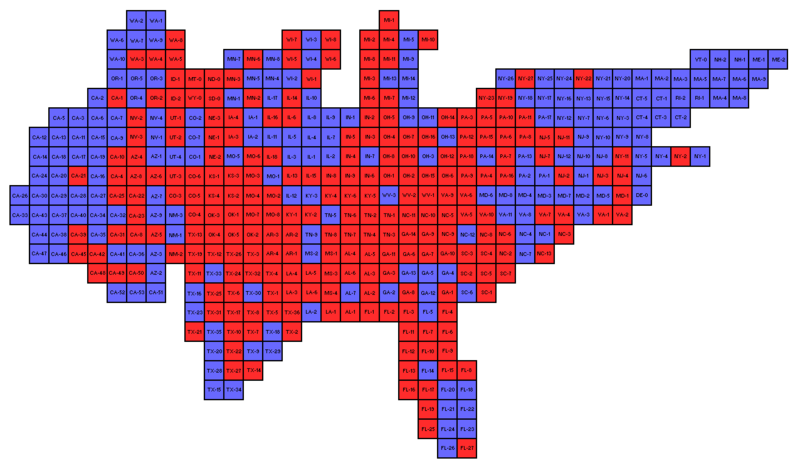 Here's a cartogram of Congressional districts for 2012 (which is similar in composition to 2016). Congressional districts have roughly the same population. Due to gerrymandering and the natural clumping of Democrats in urban areas, Democrats have to win about 54% of the votes for the House to attain a majority. A voter in Wyoming has 68 times the political influence in the Senate as a voter in California, while a voter in Wyoming has more than 3½ times the representation in the Electoral College as a voter in New York. "...the natural clumping of Democrats in urban areas,..."
But please explain why you consider it "natural" for Democrats to congregate in urban areas. Does urban living influence people to become Democrats or do people who are already Democrats tend to favor urban areas? The rich urban Democrats take for granted the availability of economic goods - food, energy, equipment, etc. - that Americans living in rural areas produce while often facing great challenges and difficulties. The poor urban Democrats take for granted these same products in the form of government handouts. Both groups of urbanites see no downside to more and stricter government regulations, taxes on energy, etc. They view the big nanny state government as a solution rather than as the problem. They are grossly out of touch with how FlyOver Nation lives. Mike M: The rich urban Democrats take for granted the availability of economic goods - food, energy, equipment, etc. - that Americans living in rural areas produce while often facing great challenges and difficulties. 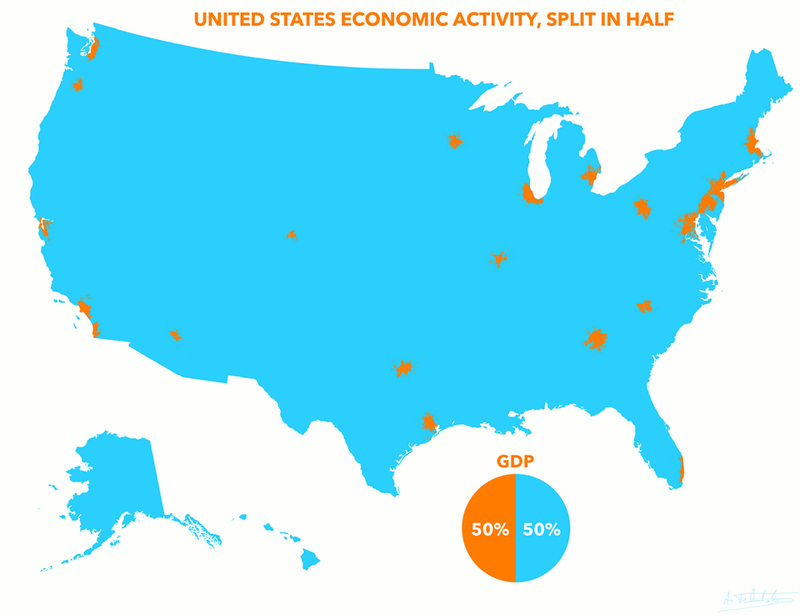 While rural areas produce many things essential for society, the fact is that most GDP is concentrated in urban areas. The Democrats invented gerrymandering. Most of the black caucus were elected from gerrymandered districts. Half of the Hispanic caucus are from gerrymandered districts. Without Gerrymandering the Democrats would lose 50 house seats. SweetPea: The Democrats invented gerrymandering. It was the anti-Federalists and Patrick Henry who introduced it to American politics in 1788. I've read articles that the Democrats cut their own throats through gerrymandering. They were so busy creating black-majority districts they didn't realize they were also creating districts which contained everyone else (i.e., the Deplorables). I'm intrigued by that old Blue state Connecticut, where I live. In 2012, voting for Romney (who one would think might be appealing) there was one red county: Litchfield, (I'm proud to live there). In 2016, there were TWO red counties. That is rather telling about the overall groundswell of support. Look, the AI chatbot researchers had to increase the gain on the neutral factoid amplifier, and attenuate the snark mod index. TT:F.
Commenter (filtered at 70%): Sorry. I’m not following your argument. DeSnark® desnarkification field suppressor is fully adjustable from basic spam removal all the way up to *plonking*. It remains to be seen if the people will be heard after the election, or whether they will be intimidated into silence. @realDonaldTrump: Just had a very open and successful presidential election. Now professional protesters, incited by the media, are protesting. Very unfair! Evidently, your understanding of 1A is very limited and shallow. I'm sure that you're aware that 1A doesn't permit one to falsely yell "Fire" in the middle of a crowded theatre. Your 1A rights are limited when they encroach on my person or property. There is a difference between "protest" and "riot." What the anti-Trump leftists are doing is rioting - they are encroaching upon the property rights of others. As an aside, what about the 1A rights of DJT 11 years ago when he uttered some vulgar comments (that were made in private and encroached on nobody's rights)? The leftist conflated his remarks with assault. Now that they didn't get the result they wanted, these same leftist are PUBLICLY making comments that are far more VULGAR and UNHINGED that any comments made by Trump. Worse, they are actually resorting to violence and literally assaulting people and destroying their property. Such is the hypocrisy of the left. I guess that's what we should expect after codling this generation of snowflakes who are unaccustomed to dealing with not getting exactly what they want (much less dealing with actual hardship). Mike M: There is a difference between "protest" and "riot." Sure. Riots are rightly illegal. However, Trump was complaining about protesters, saying it was "Very unfair!". Trump was wearing a mic and riding in an Access Hollywood bus. He was at work. Mike M: The leftist conflated his remarks with assault. No. It wasn't assault. It was bragging about assault. Mike M: Now that they didn't get the result they wanted, these same leftist are PUBLICLY making comments that are far more VULGAR and UNHINGED that any comments made by Trump. They're not the President of the United States, whose words carry a power beyond that of the individual. Mike M: Worse, they are actually resorting to violence and literally assaulting people and destroying their property.